The holidays are making the real estate pickings pretty slim, but there are still some good ones out there if you look enough. I saw this Cole Valley home at 121 Beulah on Tuesday tour and there’s a lot of potential here. Situated on a deep lot, this Edwardian home has very generous rooms, which is unusual for a Victorian. It really seems like the home is wider than 25 feet, but the tax record shows a standard 25 foot wide lot. Must have been a custom home when built and has not been on the market in 40+ years. The kitchen is dated (which doesn’t bother me) and is very Sea Ranch’y’. The bath is also dated, but charming. A separate cottage in the back garden with a bath and kitchen would make a fantastic home office. 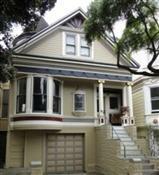 A large garage at the lower floor and a fabulous location near Golden Gate Park. Available by appointment. Two bedrooms, double parlor, dining room, one bathroom. Listed for $1,399,000 and there may be a little more room in the price. It came on the market at $1,499,000. Listed by Lena Emmery Real Estate Broker. January 2011 update: The property is pending. Sources tell me under asking. Second January 2011 update: The property closed at $1,250,000 on 1/14/11. Someone got a great deal.